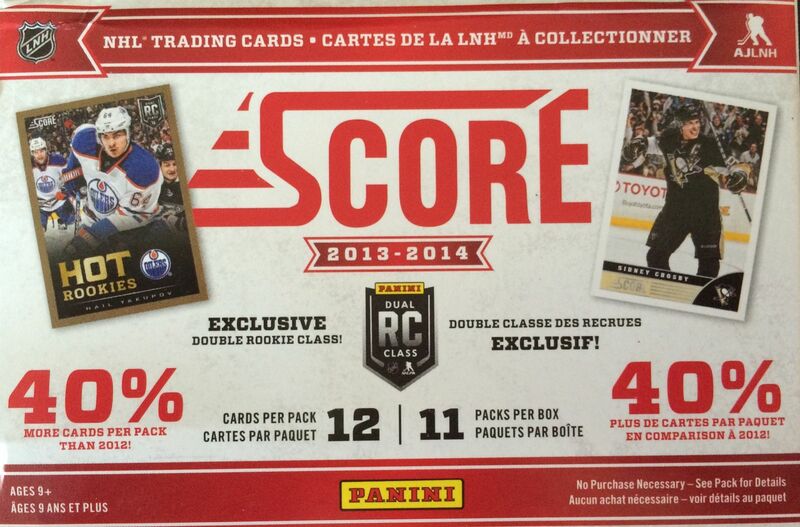 Score was Panini's low-end offering last year. Though the product was relatively inexpensive, it was packed with inserts and the occasional autograph hit. I have to admit that Score wasn't my favorite product to open, but I had to applaud Panini for putting out a low end product that had good quality and interesting cards to pull. There are a lot of different kind of cards to find in Score. It reminds me a lot of products that came out in the 90's. Big sets, parallel cards, and lots of different inserts. So this brand of cards feels right at home for me. I wasn't a fan of Panini doubling the price of the Score blaster in 13/14, but they did put some more content in it, and the cards are better quality than in previous years. 13/14 was the year of the double rookie class, and a lot of the big name rookie cards are available to be found in these blasters. Score was one of the first opportunities to pull rookies last year, but since then there have been many rookie cards released of the players depicted in this set. I'm expecting to pull a fair share of rookie cards from this blaster box. This was a very standard Score blaster. There was no hit, but I got a pretty big stack of cards with a good amount of parallels and inserts. A few of the packs even had an extra gold parallel card inserted inside. I was able to pull some different inserts and as I predicted, quite a few rookie cards came out. I was reminded as I opened this blaster of the image quality on these cards. The Score base cards have photos that have been processed well. There's almost a comic book like quality to them. I'm not sure if it's everyone's cup of tea... but I like the look. Good job to the designers at Panini for doing this with Score. This base card is a great example of the outstanding photography used in Score. 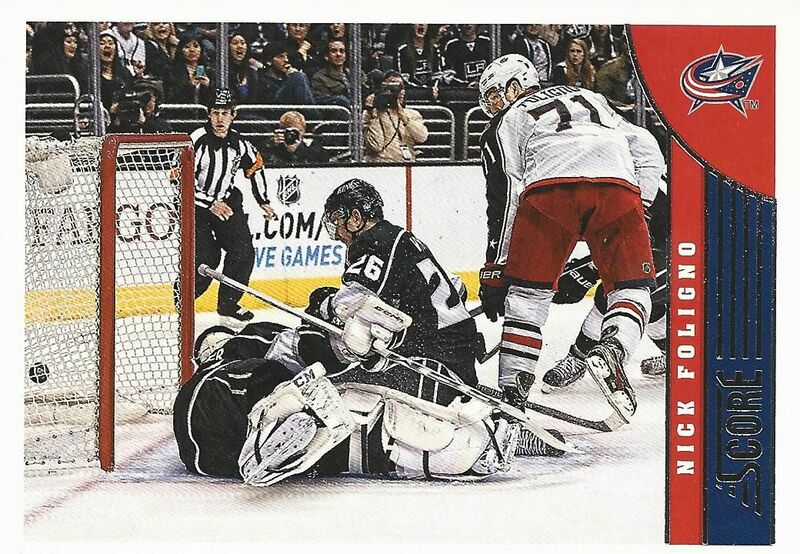 It's a great shot of Foligno scoring on the LA Kings Though Foligno has his back turned, the action going on is clear as day. Here's another card with the back of the featured player. 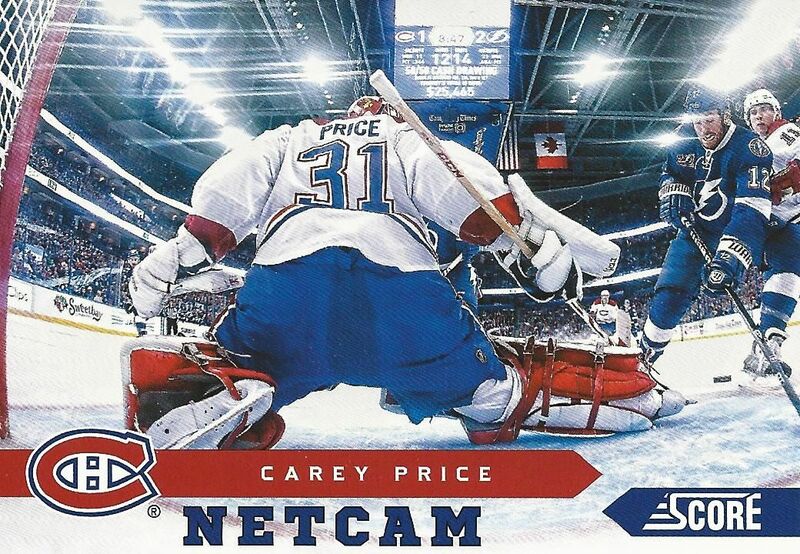 I've always liked the Net Cam cards, and Price is one of the better ones to get. This year's design is a bit simpler than other years, and it's very fresh looking. Getting the number one overall pick is usually pretty nice. Yakupov didn't light the NHL on fire in his rookie season, but he does have a strong future if he works at it. 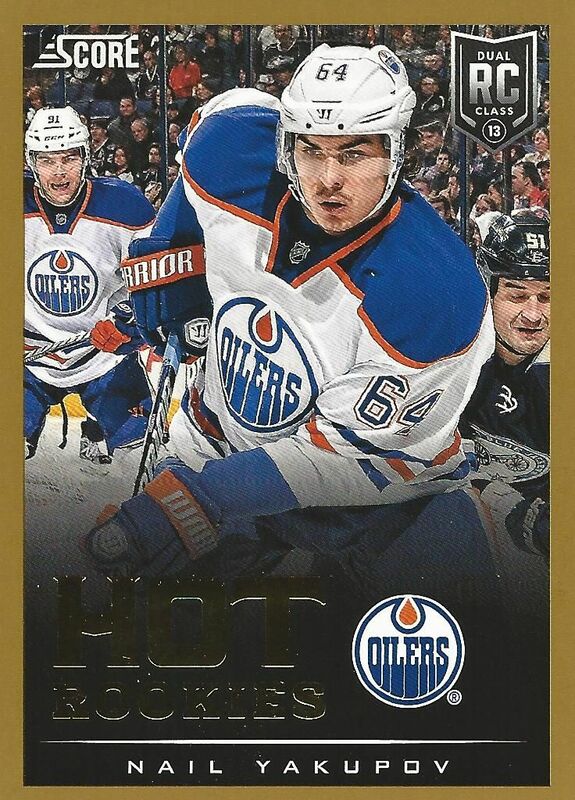 It was cool to get Yakupov's gold parallel rookie card. At under $7 online, last year's Score retail is a nice little buy. Like OPC, Score is a huge set that is great for set builders. Collectors who enjoy a more modern look should look to Score over OPC. There are plenty of things to find in Score, and the cards look nice to boot! Score is an affordable product that many will enjoy busting into.